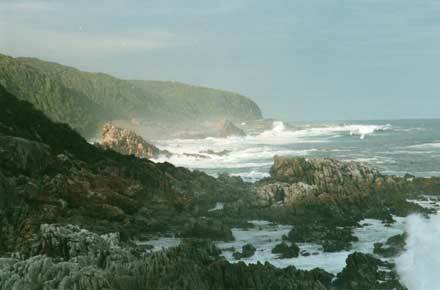 Superb trail along the magnificent, empty coast of South Africas Eastern Cape. A favourite for many. 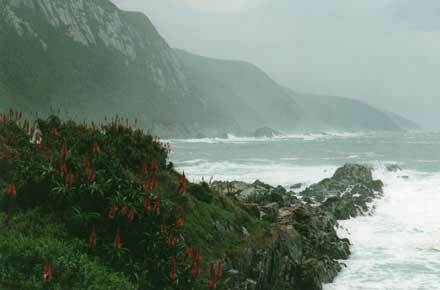 All the delights of true wilderness a variety of beautiful landscape, fascinating animals and intriguing vegetation. This is a demanding 4 5 day walk with a lot of up and down and serious river crossings, on which you will have to be self-sufficient (but sleep in huts). Come prepared. 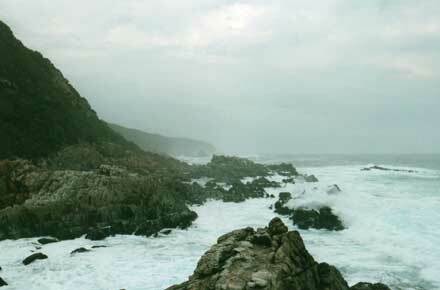 A very delightful thing, is the Otter Trail, running for some 42km along the marvellous coastline of South Africas Tsitsikamma National Park: an intense experience in true wilderness. You will enjoy beautiful and varied scenery, walking by the sea where possible but spending much of the time on the hills behind the seaside cliffs, with ravishing and completely empty view it is a rare thing to see other people once away from the overnight huts. Enjoy the roiling grandeur of the Indian Ocean, caves, cliffs and waterfalls, especially the multi-layered fall near the beginning. 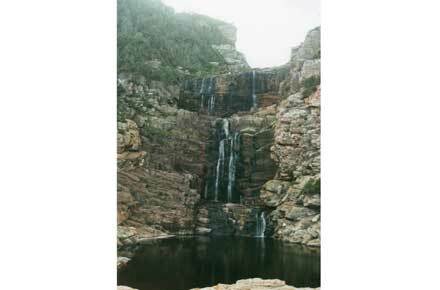 (This is a good half day walk for those short of time: take a picnic, enjoy the falls and the deep pools at its bottom.) 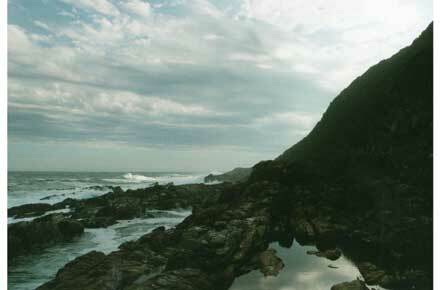 Paddle and snorkel in tidal pools and leave your prints on magical beaches. The park boasts fascinating wildlife (much of which you are, needles to say, unlikely to see): the Cape clawless otter (hence the trails name); leopards; genets and caracal; buck; monkeys and baboons. And, in the sea, dolphins, whales, seals and a multitude of birds. 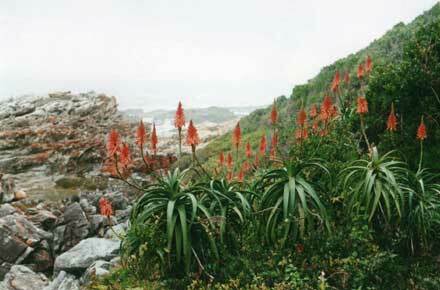 And beautiful and interesting virgin forest and South Africas unique fynbos above the cliffs and behind the beaches, with lovely wildflowers at the right time. This is a 4.5 - 5 day trek. There are four set overnights on the trail, with hut space for up to 12 available. With places so limited and the trail so popular, it can get very booked up, so reserve well ahead! This is quite a demanding walk, with a lot of steep ascent and descent. 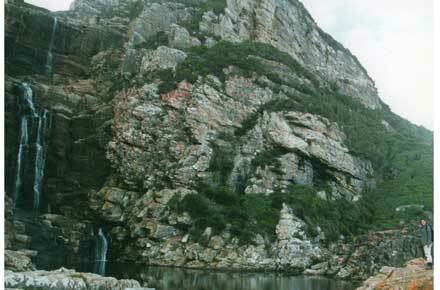 Also, there are 11 river crossings, with the Bloukrans river toward the end requiring care and planning: only attempt it at low tide unless very experienced and a strong swimmer. We should mention, though, that clambering over slippery wet rock can be a trifle dreary, and there is too much of this on the first day to in particular, when you can hanker after a high, silent mountain. You have to carry all your kit. Bring your own food, cookers, selling bags, water bottles and purification tablets. And, with river crossings to make, take great care to be sure your kit is waterproof stored, especially cameras and the like. Have a look at www.footprint.co.za/otter for a brilliant summary of the walk, with some excellent photos. What a delightful and inspiring website, by the way the absolute best of the internet. A bit like Walkopedia, really.